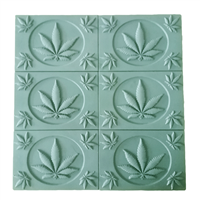 This Cannabis Leaf Soap Mold can be used to create soaps for Cannabis enthusiasts! This round bar mold has a detailed cannabis leaf in the middle. 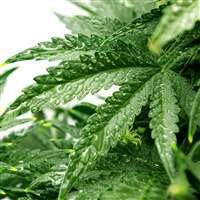 Scent with our Cannabis fragrance oil! "Is this mold or any mold reusable?" Staff Answer This is a mold and it can be used again. "I love the look of the soap pictured above. What soap recipe/mica color was used for this look? Can't wait to use this!" Staff Answer This actually is not a picture of soap but the casting for the mold. We have some great mica powders that would work well or you might also try the Matte Woodland Green Pigment which is a nice shade of green. "What size soap does this make? How many cavities does it have?" Staff Answer We do not have this mold in stock yet to get this information for you. As soon as it arrives, this information will be added to the description. Thank you for your patience.